Lake Clarke Shores homes for sale are conveniently located within minutes of both West Palm Beach and Lake Worth. Those living in Lake Clarke Shore get to enjoy the quiet tranquility of a small town while still being near all the amenities of the city. This small town is well-known for its friendly and inviting atmosphere. There are many community events going on throughout the year, such as the annual town BBQ, the Renegade Boat Parade, the antique car contest, the “Loop Around the Lake” marathon, and the Holiday in Paradise Parade. Those that want to enjoy that close-knit, neighborly atmosphere should definitely consider Lake Clarke Shores homes for sale. 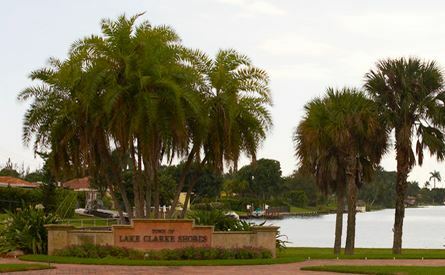 Residents of Lake Clarke Shores real estate live in a tropical paradise. There’s waterfront breezes, plenty of palm trees and lush landscaping throughout. In addition, there are many waterfront homes for sale, some of which have boat ramp access. Lake Clarke Shores homes for sale typically feature updated interior amenities like stainless steel appliances, granite countertops and wood floors. Home price ranges from $131,500 to about $600,000. Home size ranges from around 1,300 square feet to approximately 5,300 square feet. There are several recreational areas near Lake Clarke Shores homes for sale. A few of these include Town Hall Park and Playground, Pine Tree Park, and the Heart Trail. Residents have many opportunities for biking, jogging, picnicking, tennis and basketball. Thanks to the nearness of West Palm Beach and Lake Worth, there are plenty of things to do in Lake Clarke Shores for fun. There’s CityPlace in Downtown West Palm Beach. It features dozens of specialty shops and restaurants. Also in Palm Beach is Worth Avenue for upscale shopping and dining. The recently revitalized downtown area of Lake Worth contains various stores, art galleries, and dining locations. For cultural opportunities, West Palm Beach contains the Kravis Center for the Performing Arts, which hosts live theatre, ballet, and opera. There are so many options for entertainment nearby Lake Clarke Shores homes for sale. The small town of Lake Clarke Shores is abundant in amenities. It is a truly beautiful and peaceful place to live with city excitement still close by. If you would like more information on Lake Clarke Shores real estate, please contact the professionals at the Pavon Realty Group. Totally renovated lake house in the high demand town of Lake Clarke Shores, FL! Its not going to last! 3 bedroom, 2 bath PLUS office & 2 car garage. Lake lot, on the main lake (no canal), exceptional water view. Seawall in great condition with new dock! Big lot with spacious back yard! Interior was totally renovated, pictures say it all. Hurricane proof windows, doors, newer roof. Open kitchen concept, perfect for entertainment. Screened in porch off the living room adds a tremendous amount of extra living space. Excellent neighborhood and boating community, perfect to raise a family. Neighborhood is located close to 95, downtown West Palm, Lake Worth and Palm Beach Island. Its a very safe neighborhood with its own police department. Don't miss this great opportunity to own this beautiful 6 bedroom 3 bath home in the heart of Lake Clarke Shores. With an extra room attached to the garage either to be used as a office or extra bedroom.. the options are endless. Beautiful 2nd floor terrace with access to the pool from a spiral staircase to enjoy the perfect south florida weather. The upstairs flooring is brand new hardwood. Best and most spacious home in the area. Put your offers in quick because this gem will not last. How soon can you move? This extraordinary 4-bedroom, 2-bathroom WATERFRONT home is a recipe for a happy home. This spacious home sits on a lot that's .30 of an acre and boasts a 2-car garage and vaulted ceilings and exposed beams in the living and family rooms. The updated Kitchen is immense containing tons of storage space, stainless steel appliances, tile backsplash and granite countertops that match stunningly with the dark wood cabinets. In addition, you'll find tiled and wood floors throughout, a dining area, breakfast area, large living and family rooms, his & her sinks and closets in the master, a covered patio, fenced-in yard and a dock with captivating views of the lake. This high potential property is located in the much sought-after boating community of Lake Clarke Shores. The three bedroom / two full bath CBS home also includes a separate garage / workshop and large back yard with ample room for a pool. This property is centrally located with easy access to PB Int'l. Airport, shopping, theatre and I-95. Do not miss an opportunity to own a home in this lovely neighborhood. The town of Lake Clarke Shores includes a community boat ramp, a community park, a memorial park, a pine tree park, a town hall park and much more. Your opportunity in Lake Clarke Shores is now available, this super charming single family home is ready for you! Single story CBS home features 1509 sqft living, room on the side for your boat/RV, no HOA, backyard for kids or dogs to play, 2 car garage and large driveway. Lake Clarke Shores is nestled just west of I-95 with a boat ramp right down the street and freshwater lake access to Lake Clarke, Lake Osborne and Lake Ida. Downtown WPB, CityPlace and PBI Airport are just minutes away making this an ideal place to live, work and play! Come see everything this home has to offer before its too late!